The new GFB Turbo Fuse is an important safety measure against a disaster. As its name suggests, it offers reliable and effective protection for your turbocharged engine against over-boosting. Simple to install, it can be fitted to any turbo car with an existing blow-off or bypass valve in less than a minute. 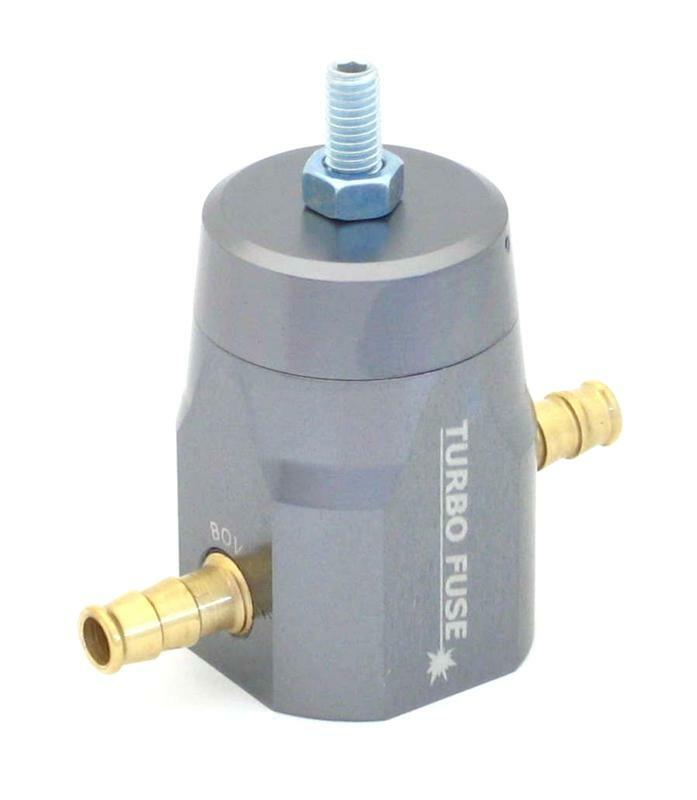 The Turbo Fuse works with the blow-off/bypass valve to relieve excessive boost pressure when triggered. It does this by shutting off manifold pressure to the top of the blow-off/bypass valve, which will subsequently blow open and relieve the boost pressure. The Turbo Fuse operates in only two states – either on or off. Unlike ineffective pop-off valves of a bygone era, which simply comprised of a spring-loaded valve, the Turbo Fuse does NOT slowly creep open as boost exceeds the trip-point. The response is instant and complete. Who should use a Turbo Fuse? A Turbo Fuse can help protect ANY turbo engine. Over-boosting can occur as a result of a sticking wastegate, popped or split wastegate hose, a faulty boost controller, or even an accidental incorrect boost adjustment. Of course, an over-boost will invariably occur during the times when you shouldn’t be watching a boost gauge. Even worse, a large over-boost can destroy an engine in less time than it takes to read this sentence. My car has a factory boost cut anyway – why do I need a Turbo Fuse? Most turbo cars feature an electronic fuel cut that performs a task similar to the Turbo Fuse. However, in the world of modified turbo cars, it is common practice to bypass or disable this feature (through the use of a “fuel-cut defender” or similar product) in order to intentionally increase boost for better performance. In this case, the engine is left unprotected. In addition, anyone who has unexpectedly hit the factory fuel cut will know that it can catch you by surprise. The engine loses all power, which can be merely annoying or downright dangerous (when overtaking for example). The Turbo Fuse is not as aggressive in cutting the engine power; it is more like hitting a “soft” limiter, which is much safer if it is unexpectedly triggered.